Michael C. Fina is a retailer based out of New York City which sells engagement rings, wedding bands, jewellery, fine tableware, vintage silver, and bath and home fragrances. If you’re looking for a gift for a special occasion, there are plenty of timeless and elegant options at the USA Michael C. Fina online store! With Big Apple Buddy’s personal shopping service, you can now buy direct from the Michael C. Fina online store anytime, anywhere. At Michael C. Fina, you can shop from plenty of different jewellery options for whatever your special occasion might be. 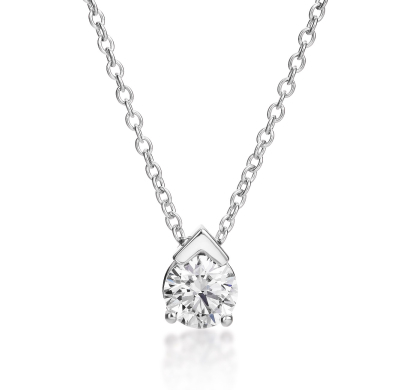 The 18K White Gold Single Diamond Pendant is a simple yet unique design that will look good no matter what. Featuring the world’s most perfectly cut diamonds, this necklace has a .50 carat diamond set in a halo of beautifully twisted metal. This once-in-a-lifetime piece will make the perfect addition to any woman’s jewellery collection! You can also shop from a variety of formal dinnerware that will immediately make any occasion a bit more special and memorable. 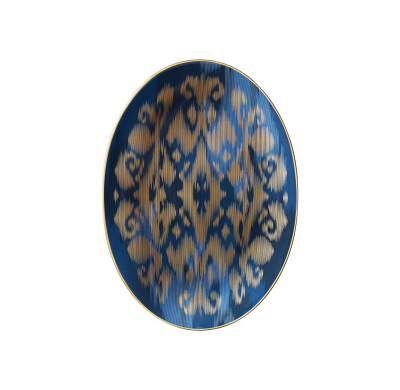 The Hermes Voyage En Ikat Small Oval Platter is made of more than twenty hues on sapphire, ruby, and emerald and is enhanced by 24-carat matte gold. The perfect size to fit on your table at a dinner party, this platter will add some extra flair and style to your home! 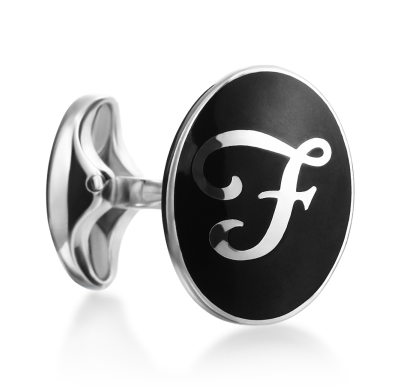 Michael C. Fina also offers a variety of accessories for men, including this Sterling Black Enamel Initial Single Cufflink. These cufflinks are the perfect way to add a bit of flair and personalization to your tailored shirts and will immediately make any outfit look more refined. Made of 100% silver, you can choose whichever initial you’d like to use and also have the option of choosing white cufflinks instead of black. This makes for a great personalized gift for special occasions and is a simple yet elegant accessory to add to any man’s wardrobe! Unfortunately, the USA Michael C. Fina online store does not currently offer international shipping. However, Big Apple Buddy, your personal shopper, can help you buy products direct from the official USA Michael C. Fina online store and ship them to your doorstep, no matter where you are in the world. We offer international shipping to over 190 countries including Australia, Austria, Bahrain, Belgium, Bosnia & Herzegovnia, Brazil, Brunei, Canada, China, Croatia, Cyprus, Denmark, Estonia, Finland, France, Germany, Hong Kong, Hungary, India, Indonesia, Ireland, Israel, Italy, Japan, Kenya, Kuwait, Lithuania, Macau, Malaysia, Maldives, Mexico, Namibia, Netherlands, New Zealand, Norway, Oman, Pakistan, Philippines, Portugal, Saudi Arabia, Scotland, Serbia, Singapore, Slovenia, South Africa, South Korea, Spain, Sri Lanka, Sweden, Switzerland, Taiwan, Tanzania, Thailand, UAE, UK and Ukraine. If you would like to buy from the USA Michael C. Fina online store, simply let us know which items you would like to order (by filling out the form on the right) and we’ll get back to you with a free international shipping quote within 24 hours!